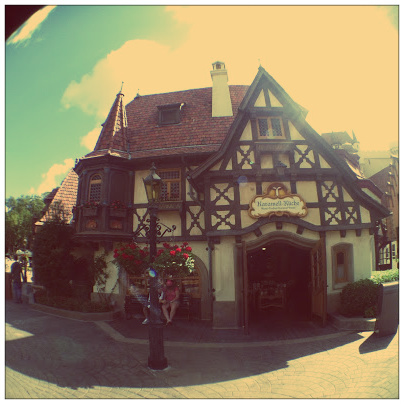 Since opening a few years ago, Germany's Karamel Kuche has been a huge favorite among Epcot fans. Given prime real estate along the promenade, this shop is sponsored by Wearthers, and being true to form sells a variety of sweets featuring their famous caramel. Among the treasures that appear in the glass case are dark chocolate and sea salt caramels, chocolate caramel covered strawberries, gorgeous and unique caramel apples (apple pie! ), and some of the BEST carmel corn I've ever had. The magical case of delights. One of the more recent and bizarre additions is that of the chocolate caramel covered grapes. This "treat" comes with several grapes skewered on a thick pointed prong. (some might call it a stake, like for killing vampires...but I digress.) They are indeed covered in tons of milk chocolate and drizzled in caramel...but no amount of sweet stuff can cover the weird texture of grapes. Don't get me wrong, I love grapes! But there is something off putting about chocolate covered grapes. I can liken the texture to that of eating grubs, though I'm not speaking from experience. As for Adam? He of course loves the grapes, and makes a point of getting some every time we're in Germany. Gross. I need some people to back me up on the disgusting texture of these supposed candies. If you think they're as otherworldly as I do, let me know. Love love love the chocolate covered grapes! Sadly in January they didn't have them when I went. Ended up with the dipped pineapple instead, which was awesome too. I've never even seen these. But they sound kind of terrifying. They are fabulous! Like little chocolate covered eyeballs...squish! I have never tried them. Now I am going to. I will let you know.